Peyton and I have a few trips planned this fall. We are going to be taking a few road trips, heading to a convention and taking a vacation in Florida. With all that traveling I need to be organized. 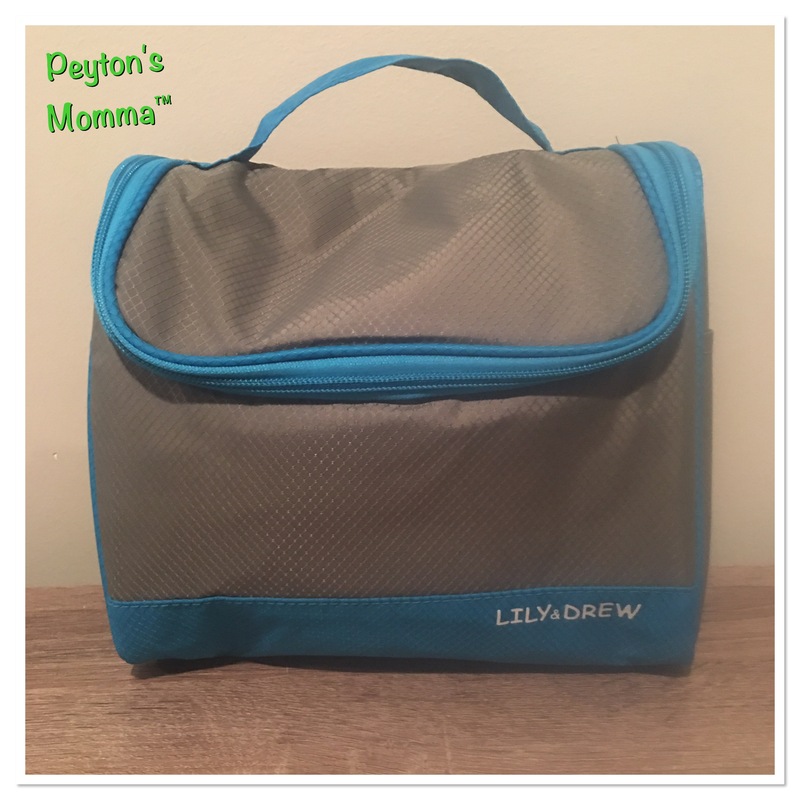 The Lily & Drew hanging toiletry bag will be helping me stay organized this fall while on the road. 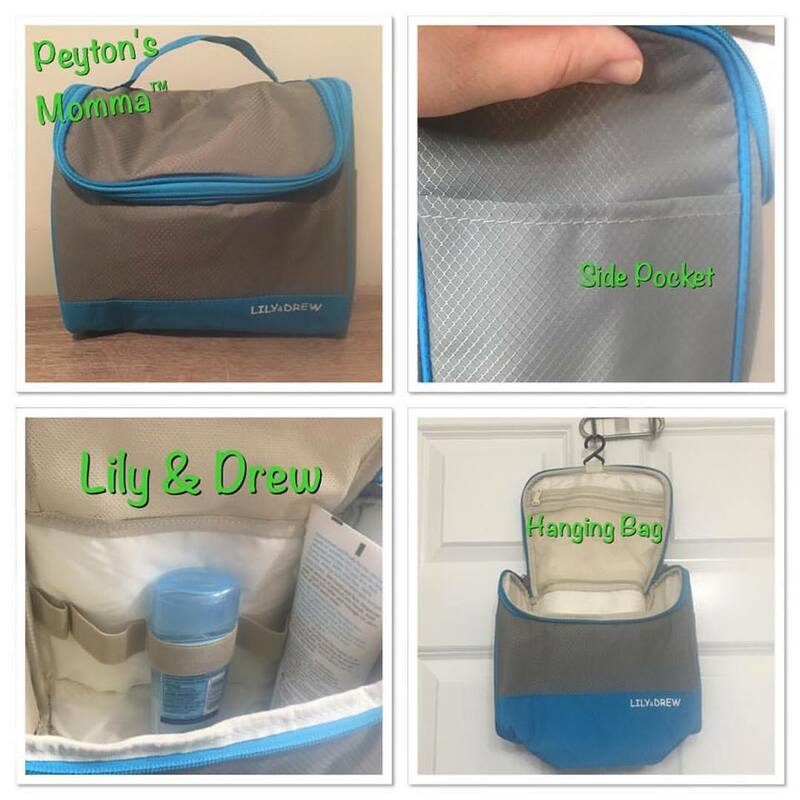 Lily & Drew have designed a hanging toiletry bag in several colors that is perfect for men or women while on the road. Earlier tonight I wanted to see just what all I could fit inside the bag. Well, I was able to fit my whole FULL SIZE skin care line inside the bag! Plus deodorant, perfume and oral hygiene products. All of them were standing up and majority of them were held securely in place with the straps inside the Lily & Drew bag. The straps inside the bag are important to me. These will help keep the bottles upright and keep them from leaking. I was impressed I could store my full-size items inside the bag. Typically I purchase travel size for trips but now I can bring along my full size beauty products and not worry about them being tossed around inside a suitcase. There are also pockets on each side of the bag, These are perfect for putting a single use facial mask. The handle makes it easy to hold onto and transport. When we take road trips I’ll be throwing this inside our duffle bag. When we take long distance trips that require a plane ride I’ll be storing this inside my suitcase. I really like the hook. I can hang the bag on the back of a door or a hook on the wall. It helps to keep it out of the way and off the counter top. When you are sharing a bathroom with others it’s nice to keep the counters clear. Or think about when you are on a cruise. There is not much space in those cabins, let alone the bathrooms. Hanging up your toiletry bag will really help when you are short on space. If you have vacations planned, will be traveling with others or just like to be organized you should look into the Lily & Drew bag.